Yoga has been shown to reduce stress and improve your overall physical fitness, strength and flexibility. Sound like something you’re into? 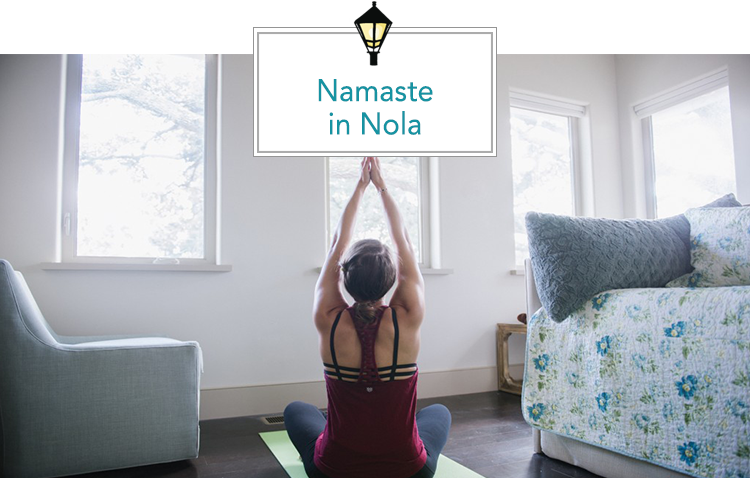 Like many cities in America, there’s a fantastic yoga community, and today we look at five of our favorite New Orleans yoga studios! Higher Power seeks to help you attain physical, mental, and spiritual benefits through breath, movement and meditation. Located at 514 City Park Avenue, this Mid-City studio offers several classes for experts or beginners. These include heated power classes, Yogalates, a fast-paced fusion of yoga and Pilates. You also may enjoy Candlelight Yin yoga which focuses on poses, mindful connective tissue stretching, yoga breathing and an extended savasana. Unique to New Orleans, Higher Power also is famous for their rigorously fun cycle classes. You can find a schedule of classes here. This Uptown favorite is located at 725 Magazine St. (upstairs above Bittersweet Confections and Haute clothing) in a beautiful exposed brick studio. With over a dozen different classes, they have something for everyone no matter how many times you’ve practiced before. Reyn Studio options include an all-levels power hour, yogalates, restorative, vinyasa, and flow classes. Check out their classes and times here. Yes, Yoga is a gorgeous studio located Uptown at 8338 Oak Street that aims to make you feel welcome, comfortable and connected. They have a studio that features unmatched climate control, fresh air flow, humidity control, comfort and cleanliness. If you are a first-timer, be sure to take advantage of the $25 for two weeks of yoga! For a full list of classes, click here. With locations in New Orleans, Morgan City and soon to be Old Metairie, these instructors aim to assist in discovering your full potential, living passionately, and creating confidence and new possibilities. Free to Be employs a vinyasa-based style that follows Baptiste Power Yoga’s Journey Into Power sequence. With several energetic classes, you can find something you’ll enjoy, especially if you try their intro special of four weeks of unlimited yoga (30 days) for only $39! Check out when you can attend here. With two locations to serve you (Uptown on Perrier and Downtown inside the New Orleans Healing Center), you’ll find a group that believes in savoring life as a source of passion, creativity, and play. Wild Lotus offers a multitude of classes and several of them focus on those easing their way into the practice. If you’re looking for a new studio, first-timers can get 30 days for $33. Click here to view their full schedule of classes.